“I am a visual storyteller. Narratives connect and frame my work. My art is social, topical, and often connected to family. ‘For Our Peter’ is a block ink print on found paper; one print in a larger series exploring hands and the storytelling opportunities found in the art of henna. The hand print belongs to an elderly aunt, who lives on a stretch of rugged coastline in Massachusetts. A feisty mother of six, fluent in both French and English, an avid bird watcher, a maker of chicken pot pies; all of her stories are woven into the artwork. At the time I was creating this print, my son was making a solo trip through Europe. ‘For Our Peter’ channels the wisdom of experience and perspective; it tells the story of holding on, while letting go. I am a working artist, practicing and teaching in the Washington Metropolitan Area. Primarily a printmaker and photographer, I teach art classes and workshops in local schools, at the Strathmore Museum of Art, Glen Echo Park Arts Center, and Fox Hill Senior Center, as well as in my home art studio. “I think this is a very compelling piece, I think there’s such an interesting story at hand. The opaqueness of the blue ink that’s used to articulate the form of the hand shows so much detail, and I love that you have the color of the envelope coming up from beneath it to be the highlight, I think that’s a really strategic use of your materials. I also love how much detail you put into this drawing. Within the hand, there’s such specific marks that clearly took a lot of time, and themselves tell a story. I would love to see you incorporate even more of the envelope into this drawing, if there was additional context for the hand I think it could really help tell your story. I’m also fascinated by the use of the envelope as a form, and how possibly filling out all the additional sides of the envelope, and running the drawing off the sides of the envelope, could continue to articulate a story. Great job! 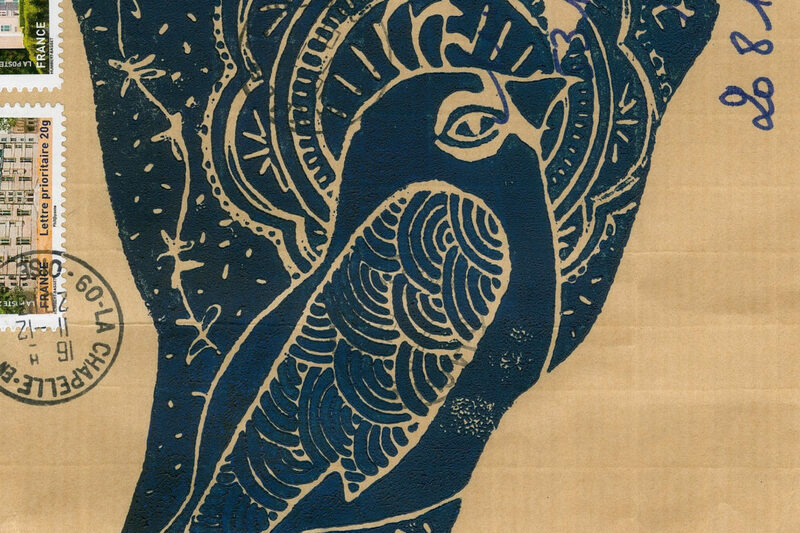 4 responses on "Lisa Grand Murphy"
This block print is beautiful. The design flows well and reminds me of storytelling done through quilts, or aboriginal map paintings. The navy blue ink was a great choice. 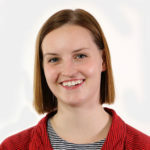 While you’re articulate about your concept and sources, I’m looking for a little more connection between your subjects and the work. I see the strong aunt’s hand, and the journeys she must have been on, but where does your son come into all of this? Is the aunt sending the letter to Peter, the position of the hand a gesture of passing the parcel on? If I were you, I would research further into postage, and time/cancellation stamps. This image has a lot in common with mail art. Artists like Ray Johnson, Crackerjack Kid, and Ryosuke Cohen are all people who use the postage system to invent narratives, highlight political issues, and create visual and social connections across a global network. 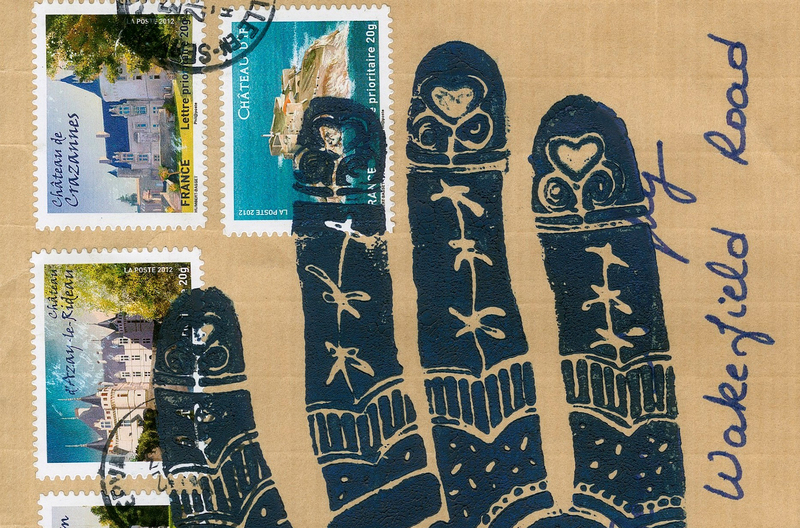 Maybe think about joining the mail art community, and send one of them a letter or a postcard! 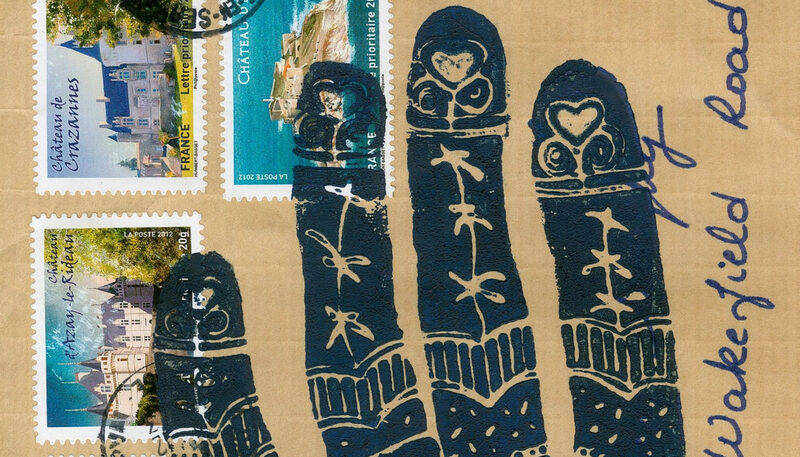 The layering of the block print over the stamps and envelope is a lovely, elegant pairing. The patterning in the hand is beautifully carved, you obviously have a lot of facility in block printing! 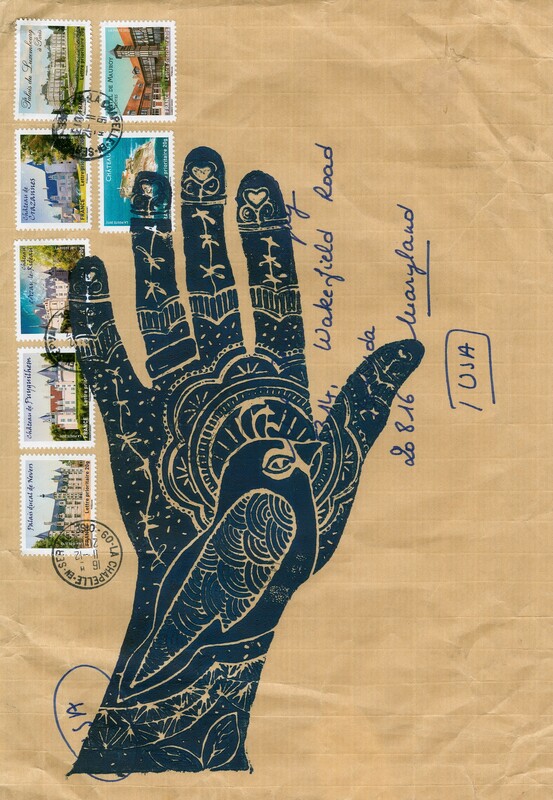 I would love to see what would happen if you layered many more hand prints onto the envelope, perhaps even using different colors for each hand. Or perhaps even collage several envelopes together; basically what you’ve already done, but do exponentially more of it! The slight details that show that this hand is specific to one person, rather than a generic hand, are so satisfying and makes this piece very personal. It totally changes the way we read the carvings within it! The areas that overlap with the hand are some of the strongest for me, and I would love to see you explore this more! It adds a level of depth and some great dimension to the piece! It also creates curiosity, causing me to spend time trying to figure out what I’m seeing through carved out areas of the print! You’re doing a fabulous job of exploring a rich, and personal, topic! 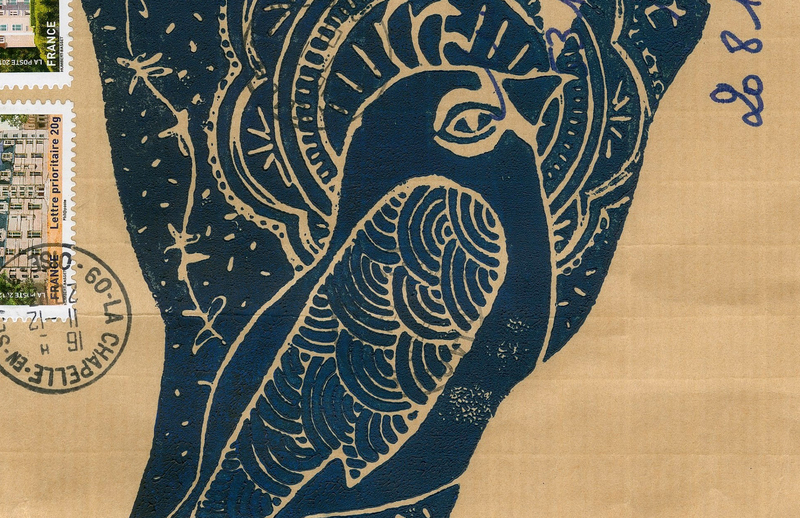 The block print in this piece is so elegant! 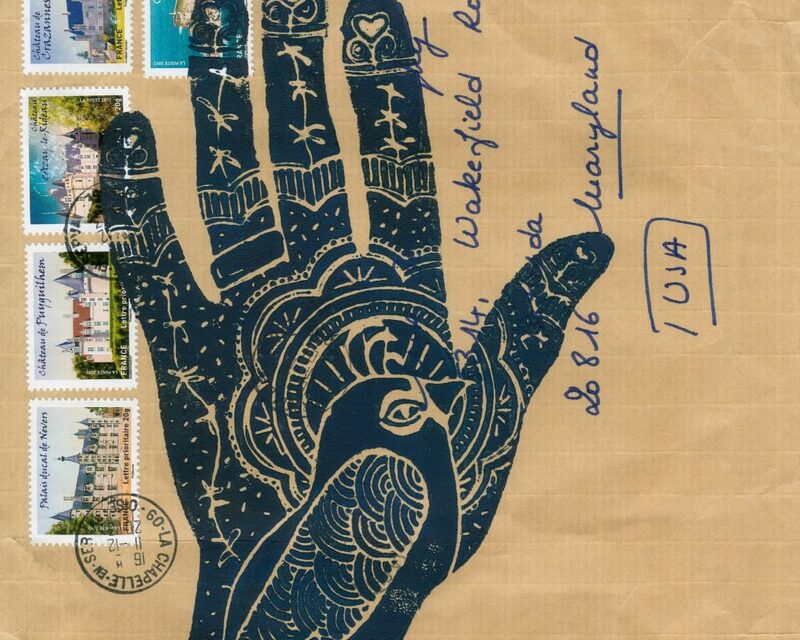 I’m especially drawn to the moments where the print overlaps with the stamps and address on the envelope, and would love to see these elements interact further in future pieces. Considering your interest in using found objects as a work surface, perhaps the next step would be to collage segments of a few different envelopes or other ephemera from your son’s trip? There’s so much potential in this subject matter – you’re really onto something, here.